1. Refer this organisation letter No. B/49711-NewSmartCard/AG/ECHS dated 23 Jan 2018. 2. In the new system all the applicants, except old card holders are being issued online generated temporary slip with details of each family member of the applicant. A sample of the online generated temporary slip is attached for reference. (a) PPO / Pension Book of ex serviceman / family pensioner. (b) Service Book / Discharge Book of ex serviceman / family pensioner. (c) Date of birth of dependents as per discharge book / dependent cards. 4. The Temporary Slip will be valid for a period of three months from the dated of issue. The validity of the temporary slip subsequently can be extended further for periods of three months at a time only after checking the online status of the application. 5. 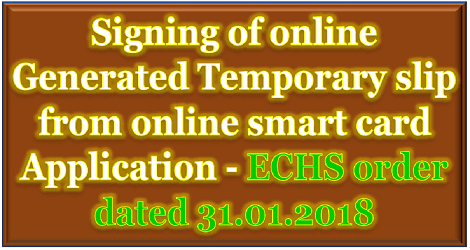 The online generated temporary slip as well as the old temporary slip or old card as the case may be is required to be submitted at Stn HQ, at the time of collection of New Smart Card. 6. For Regional Centres only. Please disseminate contents of this letter to all ECHS Polyclinics and Stn HQs in your AoR by fastest means for immediate action. 7. For MP-8 only. Please disseminate contents of this letter to all Record Offices of the Army for information. 8. This letter supersedes all the letters issued by this organisation prior to this date on subject.